Your organization needs to revisit its Microsoft strategy to prepare for 2020. 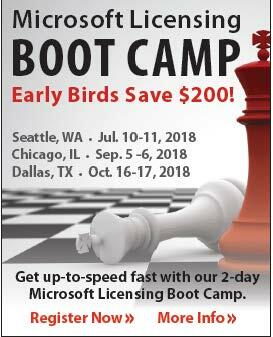 The next Directions on Microsoft (DOM) Licensing Boot Camp is in Chicago, IL, Sept. 5-6, 2018. This intensive, 2-day training is the best way for you to get the critical knowledge and understanding you need to intelligently evaluate your options and make informed decisions that keep your organization compliant without overbuying. Take the optional EA Negotiation Workshop and specialize in key methods of negotiating with Microsoft.